The Metrodata AP platform enables the interfacing of odd serial bit rates, standard telco services and infrastructure, and LAN/IP and other non-ATM services into a single converged platform. Narrowband (8kbps) to Wideband (155Mbps STM-1/OC-3) data rates are supported. The AP is a multi-standard convergence platform enabling the integration of multiple disparate services over a common infrastructure. North American and European terrestrial telecoms and datacoms services are supported, as well as common serial, satellite and broadcast interfaces. Specialist modules unique to the AP enable the creation of efficient Satellite and Defence infrastructures. 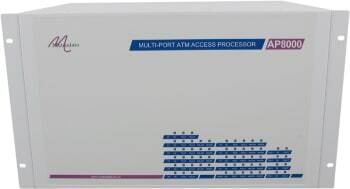 The AP can be used as a simple ATM switch, an Access Concentrator of non-ATM services, or even as an Interface Converter/Fibre Optic Multiplexer. 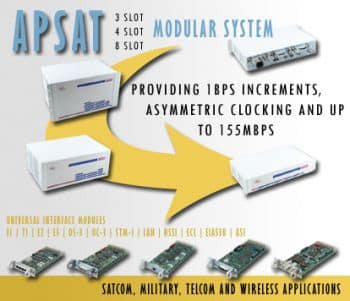 The AP interface modules have evolved out of existing carrier/telco products and also customer requirements for back-hauling satellite links and multiplexing terrestrial services over satellite. The AP can support a mixture of ATM and non-ATM traffic, typically using ATM as the transport mechanism which is transparent to both the application and the customer. The AP is a flexible modular platform which can support a wide variety of communication transmission applications, of which a few examples are shown below. This application diagram shows how a pair of AP3000s can be used to back haul a variety of different data services from a satellite earth station to a remote router. Asymmetric services with exacting clocking and timing requirements can be implemented using the flexible interface modules supported on the AP platform thereby maximising the satellite data throughput. A wide variety of satellite modem interfaces can be supported including EIA530, HSSI, ECL and ASI, and these services can be back hauled over a wide variety of terrestrial leased lines including E3, DS3 and STM-1/OC-3. This application diagram shows how a wide variety of ATM services can be transported over satellite services operating both symmetrically and asymmetrically at flexible transmission rates. The serial ATM UNI modules (EIA530 UNI, HSSI UNI and ASI UNI) support the transport of native ATM cells across the serial interfaces offered by satellite modems, and having DTE interfaces, these modules will operate at the exact speeds specified by the satellite modems, even highly asymmetrically. A wide variety of ATM services including E3, DS3 and STM-1/OC3 can be transported over a wide variety of satellite modem interfaces including EIA530, HSSI and ASI. This application diagram shows how encrypted data can be transported across an ATM network. Flexible circuit emulation modules supporting exact frequencies and complex clocking modes transport encrypted data transparently across an ATM network irrespective of the application or data rate. This application diagram shows how multiple services can be converged over a satellite link. Voice, video and data services can be converged, prioritised and transported across a satellite link. The flexibility offered by the different AP interface modules allows a wide variety of voice, data and video services to be supported, for example: E1 PBX, HSSI and Ethernet router data, E3, DS3 and STM-1/OC3 ATM switch data, as well as E3 and ASI broadcast video. This converged data can be transported over a wide variety of satellite modem interfaces including EIA530, HSSI and ASI. This application diagram shows how a high speed data service can be provisioned over a satellite link. Metrodata have a number of customers who are benefiting from maximising their satellite data throughput by overcoming the historic limitations imposed by their terrestrial network. In particular problems arise when trying to deliver satellite services above 52Mbps (the maximum rate supported via router HSSI interfaces and STS-1/OC-1 services) and below 155Mbps (which can only be achieved with the highest performance satellite infrastructure). This application diagram shows how multiple high speed data services can be provisioned from a single hub over multiple speed satellite links. The associated infrastructure savings within the satellite earth station can be considerable. The AP3000 is typically used to back-haul Asymmetric satellite services cost effectively over fiber, WAN, ATM or microwave radio links. The AP3000 can also be used as a Satellite de-multiplexer in a Hub/Spoke network. 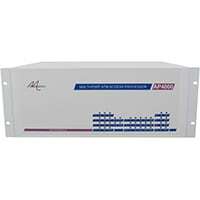 The AP4000 is typically used as a Satellite Hub Multiplexer to aggregate multiple terrestrial services over satellite, or aggregate multiple satellite services over fiber, WAN, ATM or microwave links. Where redundant power supplies are a requirement it can also be used as a Satellite de-multiplexer in a Hub/Spoke network. The AP4000 can be used for high speed satellite link back-haul, where there is a requirement to support 3-4 satellite services over a single link. The AP8000 can be used to aggregate multiple satellite services at high data rates, across a variety of infrastructures. 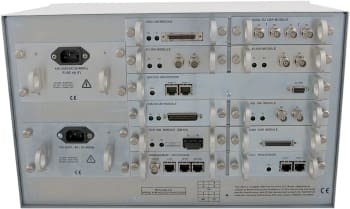 Within Military Satcoms it provides a means of multiplexing up to 8 remote satellite terminal links onto a single back-haul or reach-back link. Added to this is the fact that it can run 7 EIA530 Crypto End to End links at a Maximum 20Mbps per link. There are many different ways of using the AP to converge and transport a variety of different non-ATM services over either non-ATM or ATM infrastructures. These modules use unstructured AAL.1 adaptation to transport data streams with ANY payload data format transparently over alternative infrastructures. Quad T1 CE module - legacy services at 1.5Mbps Telecom rates, e.g. North American leased lines. Quad E1 CE module - legacy services at 2Mbps Telecom rates, e.g. PBX, E1 G.703 2Mbps leased lines. Dual E1 CE module - legacy services at 2Mbps Telecom rates, e.g. PBX, E1 G.703 2Mbps leased lines. Dual E2 CE module - legacy services at 8Mbps Telecom rates, e.g. E2 G.703 8Mbps leased lines. E3 CE module - legacy services at 34Mbps Telecom rates, e.g. E3 G.703 34Mbps leased lines. DS3 CE module - legacy services at 45Mbps Telecom rates, e.g. DS3 G.703 45Mbps leased lines. 10/100BaseT LAN CE module - transparently bridges 10/100BaseT LANs. EIA530 CE module - serial data streams (of up to 20Mbps), e.g. router serial cards, encrypted data and satellite modems. HSSI CE module - serial data streams (of up to 110Mbps), e.g. router serial cards, encrypted data and satellite modems. ECL CE module - serial data streams (of up to 110Mbps), e.g. router serial cards, encrypted data and satellite modems. ASI CE module - broadcast video data streams (of up to 52Mbps), e.g. video codecs, satellite modems and broadcast infrastructure. These non-ATM services can be concentrated, muxed using the ATM modules shown on the ATM UNI Modules tab, as well as being integrated with ATM services and muxed over ATM trunks. The Metrodata AP supports the standard ATM interfaces common on other complimentary ATM switches so we can easily interoperate with Cisco, FORE, Alcatel etc. We also specialise in supporting legacy and new serial interface speeds on our AP platform, providing ATM cell transport over serial. A great deal of deployed AP units are with the US DoD and as such we have developed and continue to develop specific modules for Defense requirements, as well as adding Defence features to existing Modules. E1 ATM UNI - enable connection to ATM services, either as network or switch ports. E2 ATM UNI - enable connection to ATM services, either as network or switch ports. E3 ATM UNI - enable connection to ATM services, either as network or switch ports. DS3 ATM UNI - enable connection to ATM services, either as network or switch ports. STM1/OC3 ATM UNI - enable connection to ATM services, either as network or switch ports. APS Protected SDH UNI - enable important circuits to have a backup fibre to ensure network survivability in the event of failure. EIA530 UNI - enable direct connection to an EIA530 satellite modem at up to 20Mbps, supporting native ATM UNI data. 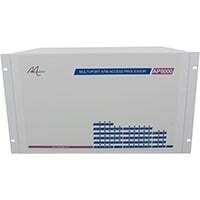 HSSI UNI - enable direct connection to an HSSI satellite modem at up to 110Mbps, supporting native ATM UNI data. ASI UNI - enable direct connection to broadcast infrastructure, e.g. an ASI satellite modem at up to 155Mbps.